Lieut. W. B. Haviland U. S. Navy, Jan. 1907 - Jan. 1911 -- American Ambulance Corps, 1915, in Alsace (17 continuous months at the Front). U. S. Navy, 1918 - Chief Pilot at Dunkerque; one month special duty with the 13th Squadron, R. N. A. S. as Pilot of "Sopwith" (Camel) single-seater. Two years in French aviation. Commanding Officer, U. S. Naval Air Station. Porto Corsini, Italy, July 1918 - January 1919. Motto: "Go get 'em - talk about it afterwards." Here is an attachment containing a photo of Lieut. Willis B. Haviland, Commander Officer at Porto Corsini USNRF Air Station. I am sorry for its quality, but I photocopied it from "The Leading Edge" vol. 1 n° 3 -Christmas Edition- Dec. 25, 1918. I think this newspaper was published three times only, since the base was out of commission on Dec. 31. Unfortunately I miss vol.1 n° 1 & 2. Below the picture there is a short paragraph describing his military career.Please note that this is the only image I have of Lieut. Willis B. Haviland. Editor's Note: I am very grateful to Claudio for sharing this important bit of history with us. No apologies necessary for the quality of the picture. Even one as poor as this one is ever so much better than nothing. We are very appreciative of his efforts. Training a Thousand Air Students Training one student or a score of students for aeronautical work is an easy matter -- a one-man job, in fact. But training a thousand students is immensely more difficult. It is an undertaking so extensive that it can be accomplished only with 100 per cent equipment, 100 per cent personnel, and 100 per cent organization. An interesting example of such comprehensive enterprise is that of the Universal Aviation Schools. Universal is operating ten schools in important cities throughout the Middle West, covering every branch of aviation training. 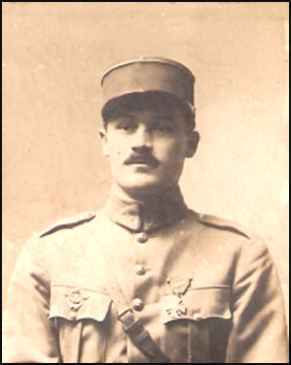 At the head of the Universal Aviation Schools is Willis B. Haviland, who was a Lieutenant Commander in the Navy during the war, and who previously had served with the Lafayette Escadrille, having received numerous decorations and citations for acts of bravery. Editor's Note: This link has become obsolete, (3-3-05), and the article can't be recovered. ONLINE RESOURCES If you search for "Willis B. Haviland", using the Google search engine, (1-4-06), you will find abut 25 links, including this page. Without question, the most unique and helpful is the following. "Welcome to An Earlybird's Scrapbook. I'd like to take you through an adventure that begins with one of the first military air squadrons ever, the Lafayette Escadrille of France, and and let you meet many of the famous flying aces of World War I. View the perils of canvas biplanes and lighter than aircraft. See the advent of seaplanes for battle. Witness the first flights off of ships and other experiments, and learn how such feats were achieved. This adventure is made possible through the scrapbooks of my Grandfather, Willis B. Haviland, who was one of the first military pilots ever, who was one of the first people ever to fly an airplane from a ship, and who ended his career building the naval rearmament station at Whidbey Island, WA where he died in military service. It is my quest to preserve these ancient photographs while they are still legible, and share them with all who may be interested. You may recognize some of the photos that appear in this site as appearing in accounts of the squadron in books, magazines and on other historic web sites. Well, folks, here are all the original photos from the Haviland scrapbooks in one place! This web site is dedicated to the Earlybirds, those pioneers of the skies who were very much akin in spirit to the fabled knights of King Arthur's round table, and to all men and women who boldly take their flying machines into harm's way to protect the values of freedom and liberty throughout the world. God bless you all. This website is a work in progress, and I think a work of love, and already, (1-4-06), offers a wealth of material of enormous interest to our online community of early aviation fans. I know you will enjoy visiting it, which you may do by clicking on the title above. (Letter from Adj. Pilot W.B. Haviland from Pau, France.) I was alerted to this letter by his grandson, Willis Haviland Lamm. He pointed out that it contained a very interesting reference to Charles Weymann. You can find it in the original letter where it appears on page 5. I suggest that you will probably want to read the entire letter as it is very interesting and offers a glimpse into the lives of the aviatiors during that period of World War I. You can access the letter by clicking on the title above. Uncle Sam at Porto Corsini "IN THE ANNALS of Naval Aviation in World War I, no exploit for daring of execution and success in pulling it off is exceeded by that starring Naval Aviator #1494, Ens. Charles Hazeltine Hammann, USNRF. He and his fellow pilots were a unit of Naval Aviators who operated out of Porto Corsini in Italian planes." The paragraph above, which is excerpted from the U.S. Navy History website, emphasizes the importance of this episode in the history of Naval Aviation. A very comprehensive revue of the history of the Navy in Porto Corsini was suggested to me by Claudio Battistini. You will find sections devoted to History, Photos, Documents and Links. You can access the website by clicking on the title above. How are you? I'm sending these few lines to tell you the latest info about the USNRF Station at Porto Corsini (July-Dec. 1918). While scanning some local papers I found out that there is a tombstone placed in a crypt at the Old Ravenna Cemetery. It concerns Ensign Edward I. Tinkham who died 3 months after his demobilization. As far as I know his father came to Ravenna from the States in order to assist him and after his death he cremated the body, but his ashes were never buried in Ravenna. I don't know who placed the stone and why. as you see it is written in English. I wonder if the triangle at the right bottom corner have any meaning. "The first Americans in combat during World War I were part of an ambulance unit of thirty-five courageous Cornellians led by Edward I. Tinkham, Class of 1916, on March 24, 1917." A biography of him is found on the Cornell Alumni News of April 10, 1919. Here is an extract from that publication. 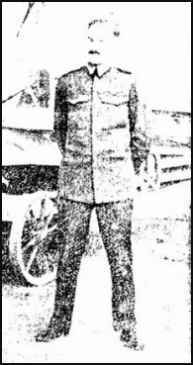 "In October, 1917, Tinkham enlisted in the Naval Air Service, and received his prelimninary training at a school in Southern France. In May, 1918, he was transferred in a school in Italy, where he was commissioned a flight ensign. He had been ill since the beginning of this year." Clearly he hadn't soloed before the cutoff date for membership in the Early Birds, but his story is of interest to any student of the period. There are a number of other links available for anyone who wants to learn more of his life and career. Willis is listed among the many members of the service. You can visit this site by clicking on the title above. You may want to use the "Find" function on "Haviland" to locate his entry on the page. The Navy Cross to Members of the US Navy World War 1 You can read the complete text of the award of the Navy Cross to Lt. Willis B. Haviland on this website. You can visit this site by clicking on the title above. You may want to use the "Find" function on "Haviland" to locate his entry on the page. While surfing the net I have come across this site: http://www.earlyaviators.com/ehavilan.htm. 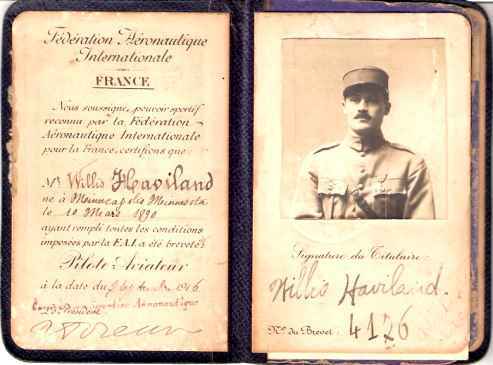 I should be very grateful if you can send me more info about Commander Willis B. Haviland who was Commander Officer at Porto Corsini USNRF station (Italy) from July to December 1918. Editor's Note: If you can help Claudio with more information, please contact me and I will put you in contact with him.